Unfortunately, the incident brought forth the worst local left and right wings can offer in the line of badmouthing. Even more unfortunately, this is a trend lately. Evidently, people don’t learn or, at least, do not remember for a long time the lessons about the verbal dirt-throwing and its consequences. Words have a tendency to kill – in their extreme use. I don’t know if it’s clear that the horned Chazan caricature is a direct reference to “Rhinoceros”, a play by Eugène Ionesco which belongs to the Theatre of the Absurd. The play is actually a fable on the way fascism takes over otherwise reasonable and decent human beings. 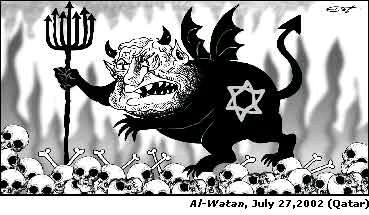 The intention behind the image I assume was to show how a socialist Zionist like Chazan can turn into a rhinoceros, a follower of a political fashion, and unwittingly collaborate with anti-Zionists to the point where the organization she heads would actually help in the demonizing of Israel. 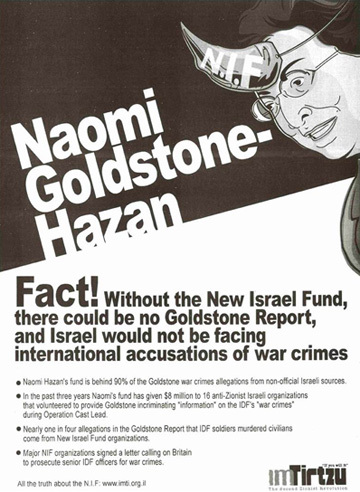 The fact that the horn is attached by a string actually proves that the ad does not claim she has turned into a bona fide rhinoceros; she can still divest that unseemly horn and reverse to her former and unambiguous Zionist self. 1) You cannot complain about the guilt by association tactic of the left and support the same tactic from Im Tirtzu. Either both are right to function like this, or both are wrong. Personally, I think that there is nothing wrong with the guilt by association tactic. The question is what is the nature of the association. Who you are funded by or who you fund is a very important sort of association. John Hagee is a very, very bad ally to have. 2) I am not convinced by your description of Im Tirtzu as centrist. First, just because they say they are centrist doesn’t mean they are. It seems to me that they are trying to redefine where the centre is – and move it somewhat to the right. This seems to me part of a wider global mainstreaming of the hard right by attempting to claim a centre ground. For example, Berlusconi and his supporters try to define PdL as “centre right”, when clearly (although it includes centrist elements) it is more accurately described simply as right-wing, containing post-fascist and ultra-nationalist elements too. Or the new Conservative and Reformist Group in the European parliament, which also contains post-fascist and ultra-nationalist, claims to be centre-right when by any reasonable standard it is hard right. I will go and read the “reviatalization of centrist Zionist ideology in Israel“ text now and see what I think. 3) However, the word “fascist” is also subject to considerable inflation in (especially leftist) discourse these days, and I do not claim Im Tirzu is fascist or that J Street and others are correct in the sensationalist tactic they are using to defend NIF. 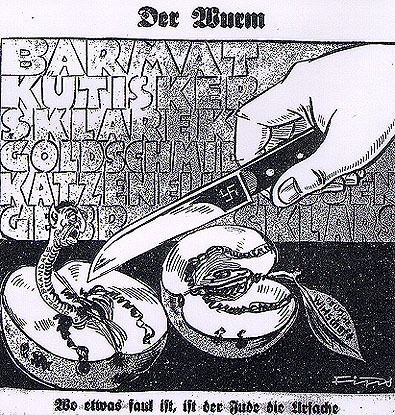 Ah, the link mentions the “revitalization” piece, and I can’t read Hebrew, so my jury remains out. I have tried to read up a little on Im Tirzu. My knowledge remains superficial, but slightly less so than before. This is my view now, with the caveat that I am far from an expert on Israeli politics, and I may have gotten the wrong end of the stick on some issues. I am willing to be persuaded on most of these things. 1. The redefinition of Zionism that places such emphasis on an undivided Jerusalem as capital of Israel (a central plank of most of their texts in English) is, to my mind, a shifting rightwards of the Zionist centre-ground. Without arguing for against an undivided Jerusalem or Jerusalem as Israel’s capital, the insistence on this as central to Zionism is a right-ward shift, and not in a good way. 2. Calls for the sacking of post- and anti-Zionist academics are also, to my mind, dangerous and wrong. While it is good to robustly argue against the likes of Anat Mater when they are wrong, it is another to call for them to be sacked. As far as I can tell, this kind of campus activism, based on the sort of model David Horowitz and co promote in America, is Im Tirzu’s main activity. Although Horowitz and co are right in many cases in their targets, I find their approach, as mimicked by Im Tirzu, very worrying. I spoke recently to an American Zionist historian, who has had good friends who are not anti-Zionists witch-hunted from academic positions because they said things which some CampusWatch activists took offence at. This sort of witch-hunting politics takes on a momentum of its own once it starts. 3. Ronen Shoval has admitted to his activists, in the heat of the moment, chanting things like ‘We will burn your village’, which he says was wrong and that he reprimanded them. Credit to him for this, but it says something about the movement. 4. In the same interview, July 2009, Shoval says his funding comes from Jewish sources – in America, in Israel, and among the students. I am not sure when their funding from CUFI came, but if it was before then, than he was being dishonest. This would not be such a big deal, if it were not for the form their attack on NIF takes, which focuses on precisely this sort of connection. Beyond Im Tirtzu, there is a wider trend towards the right in Israel, as there is in many other places. Im Tirtzu represents a less offensive side to the Israeli hard right, and is probably not fascist. Shoval says his model is Peace Now, who took marginal ideas and made them mainstream in Israeli politics. Im Tirtzu is part of a trend that is taking marginal ideas, from the hard right of the Zionist movement, and making them mainstream. This is redefining the centre, and being actually centrist. Thanks for the comments, Snoop, Noga, and Bob. Snoop, I know what you mean. Two friends of mine are on a different side of this issue than me and they have not responded to any of my attempts at dialog. I’m not sure if it is because they both have some sort of direct connection to the NIF and I have no connection to either organization but they are usually open to discuss things, including contentious things. 1) As I stated above in reply to Snoopy, I don’t think I’m taking sides here. Or, to put it another way, I am not taking a side on the allegations made by Im Tirtzu against Chazan or the NIF. Instead, I am pointing out the hypocrisy of those who regularly rely on claims of “McCarthyism” when people disagree with them and, more importantly, the absolute inappropriateness of calling opponents fascists when they are nothing of the sort. The latter was the main point of my post. As far as guilt by association, I agree with you. It is not always wrong. But it is rather strange for those who regularly denigrate this approach to adopt it when it suits their purposes. 2) The entire definition of who or what is centrist varies from place to place. It even varies from individual to individual. As I have often told friends (and anyone willing to listen), my own positions are not exactly at the midpoint between those of Democrats and Republicans. Being a centrist does mean sitting on the fence. Instead, like many (if not most) Americans, I am liberal on some issues and conservative on others. Yes, some of the most successful conservative politicians have moved the center to the right. No disagreement there. Reagan did that here in the U.S. Some people think Obama is trying to move the center to the left. To the specifics of Im Tirtzu, I had not heard about them prior to this row. I have only done a bit of research. But based on the positions they take, what they say at their website, etc. I would position them on the center-right. I do not think they are a far right group, let alone a fascist one. I think it is important to listen to people and pay close attention to the way they identify themselves. That doesn’t mean losing one’s critical faculties, but it does mean taking self-identification seriously. I can relate to Shoval’s drift from the right to the center as I have drifted from the left to the center. I have also seen (and appreciated) a desire on the part of Israelis to move away from polarized political positions and adopt a more pragmatic, centrist approach. I think looking at Kadima is illustrative in this regard. After all, many people on the far left considered Sharon a fascist at one time. Some still do. They were wrong about Sharon and Kadima and I think they are wrong about Im Tirtzu as well. 1) I agree with Im Tirtzu and other organizations that a united Jerusalem is the capital of Israel. I do not think it is a good idea to negotiate Jerusalem away to the Palestinians, Jordanians or any other group or state. 2) In a country that is under threat of terrorism and war, the state and the society must be vigilant against people who are allies of the enemy of that state and that society. To do otherwise seems totally insane to me. If that means shining a light on academics and others who support the forces of terror, I have no problem with that. That does not mean throwing liberals or people who are critical out. A fine line? Yes, indeed it is. But we are talking about people who use the benefits afforded to them by a liberal society to undermine that society. I do not agree with much of what Horowitz writes. I find he paints with far too broad of a brush. For example, I do not equate liberalism with socialism and socialism with communism. But I agree with him that there should be no room for totalitarians and the supporters of terror in our educational system. I am very interested where these supposed “witch hunts” occurred and the context. Campus Watch does not have nearly the power and influence ascribed to it by the liberal and far Left. Instead, in the cases where I have read about people losing their position or missing out on tenure opportunities it was due to other reasons than the ones given by the person on the short end of the stick. As you know, the committees that grant tenure view themselves as independent and are not prone to buckling due to outside pressure. It is far more often the case that internal tensions, even petty personal disagreements, that play a much greater role. The article you linked to does not say this. Instead the author makes a reference to “Im Tirtzu activists” but nowhere does it say that Shoval said these things. As you probably imagine, I take anything written in Haaretz about Im Tirtzu with a huge grain of salt given their blatant antagonism to the organization and its goals. 4) Yes, I agree people should be open about where their funding comes from. But I don’t these Im Tirtzu’s ideas, such as a unified Jerusalem as the capital of Israel, are ideas of the far right. 2) Yes it is important to listen to people’s political self identifications but not always to accept them. The BNP in the UK are trying to portray themselves as a non-extremist party, and their surface appearance might confirm this, until you read their private utterances and know about their recent past. Similarly, there is a long history of US Communists using a “progressive” or civil libertarian pose to cast themselves as part of the American mainstream. This is in contrast to Kadima, which was an attempt to move beyond a polarised situation, reflecting the fact that most people everywhere are broadly centrist. (It is a good, and I think still open, question, about whether Obama is a case of the former – moving the centre left – or the latter – articulating the views of the centrist majority). I guess neither of us knows enough about Im Tirtzu to place it in either category. My strong hunch is that it is in the former one. 1) I am not disagreeing with you and Im Tirtzu on Jerusalem; I am agnostic on that question (well, I quite like the idea of a Jerusalem that is both the capital of Israel and the capital of Palestine, but let’s leave that aside for now!). Rather, to claim that an undivided Jerusalem as the capital of Israel is a central, defining tenet of core, mainstream Zionism (as Im Tirtzu do) is a significant redefinition of Zionism, a significant move of Zionism to the right. 2) My problem, I guess, is how the fine line is policed. If you were policing that fine line, I’d be relaxed. But when David Horowitz or Melanie Phillips is policing it, then I’m worried. I can’t tell you the details of the witch hunts I mentioned, as the conversation was brief and I didn’t manage to hold the names in my memory. The person I was listening to was not someone I know well, but is someone who has always struck me for his integrity, and also someone who, though liberal, is very much a Zionist and actively part of the mainstream organised Jewish community. Even if he had not given these examples, I would still be negative about Campus Watch type tactics. In the UK, I have seen friends in academia suffer (not in the sense of losing a job or not gaining tenure) by the simple designation of them as “Zionists”, and I have seen samples from the bulging inboxes of hatemail sent to Jews who have expressed mildly Israel-critical views. (You may well have noted the case here of David Newman, someone I don’t know, although have crossed paths with, who has views on Israel of which I’d be critical, not deserving the calls for his death made by Michael Gross, a significant funder of British and Israeli scholarship.) What I am saying is that this whole sort of politics is bad news, the wrong sort of politics. And it seems to be one of Im Tirtzu’s main activities. So, while they may talk about creating a new centre ground beyond the polarisation, they are participating in that polarisation and in its violence. 3) I’m writing this off-line and will check later, but the Ha’aretz interviewer quotes things Im Tirtzu activists said, and quotes Shoval as acknowledging that they did and criticising him for it. As I said, credit to him for criticising them, but it looks like they did say these things, and that says something about who they are. The meaning of the horn in the caricature is far more literal, in my opinion. In Hebrew, the same word, “keren” is used for both “fund” and horn. Thus, the New Israel Fund (In Hebrew – Keren Hadasha le-Israel) can also be read as the “New Israel Horn”. Thus, Naomi Hazan is shown wearing this “new horn” on her forehead. I completely forgot about the “keren – horn” meaning. 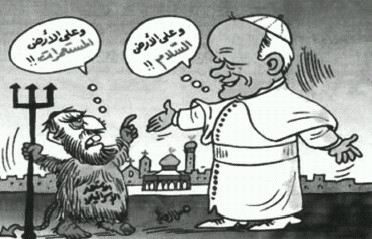 It probably explains the caricature better than my “Rhinoceros” reference.